It started off as a normal day when Asya, May and I found them, we were on our way to our placement in Harman and one of us spotted what we thought was a rat on the side of the road. At first we thought it was dead until we realised it was moving in a strange way. We all went over and the closer we got, we soon saw that it wasn’t a rat but a tiny kitten! This was the first of five that we found that afternoon. We picked it up off the road and placed it on the ground, where we found the others, scattered around the grass. We were horrified. These five little kittens couldn’t have been older than a few hours (two still had their umbilical cords still attached!) but seemed clean. We hung around a bit to see if anyone would come and collect them, or if their mother would come along. No one came. Eventually, we rang Razvan for help on what to do as we were determined not to leave them. Luckily, he said we could take them back to the flat, but we had no way of getting them back. Asya had her cardigan handy so we figured we could carry them to our placement on that and see if they had a box to take them back to Brasov. We got to our placement with this bundle of kittens and the carer was very amused. She found a box and a syringe to feed them with; she also created a mixture of milk and water so we could feed them. The children who were there at the time loved them! 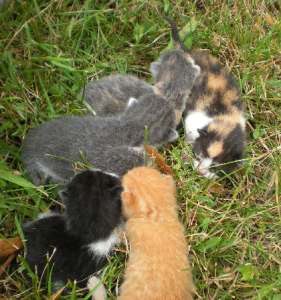 It was there where their names were given: Pheobe (before we knew he was a boy), Patrick, Peppa, Pickles and Peaches. We got them back to the flat where Razvan showed us how to feed them and made sure they were warm enough. He said we’d have to find somewhere for them before we left to go home as he could not care for them alone (we were having to get up every 3 hours to feed them, which between the three of us was hard enough!). So at certain intervals during the day and night we all took it in turns in feeding, washing and trying to make them go to the toilet. Penny, Asya, May and I were continuously searching for a place that theses kittens could go, we even asked around the hospital but we couldn’t find anyone. Soon, it came to the time that Asya and May had to go home and it was just Penny and I who had to find someone to care for the kittens before I had to go home and the new volunteers came. However, when the new volunteers, Natalia and Jack, arrived they were very understanding about the kittens and wanted to do all they could to help. Natalia persuaded Razvan to let her help find someone and take the kittens to the vets to get them checked out. I also got in contact with my friend Sarah, who was a previous bear volunteer, who was adamant to help. 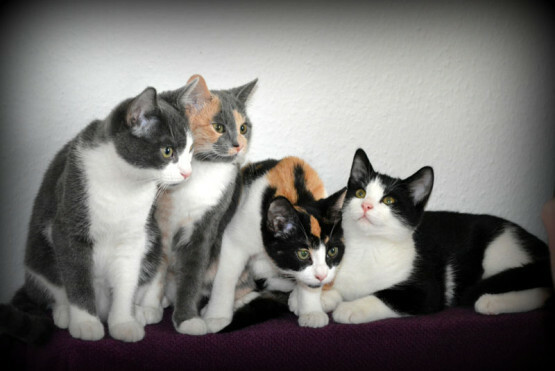 I left the next day reassured that the three volunteers were with the kittens and helping to find them a home. Natalia says that the main fight that they had was keeping the kittens alive. 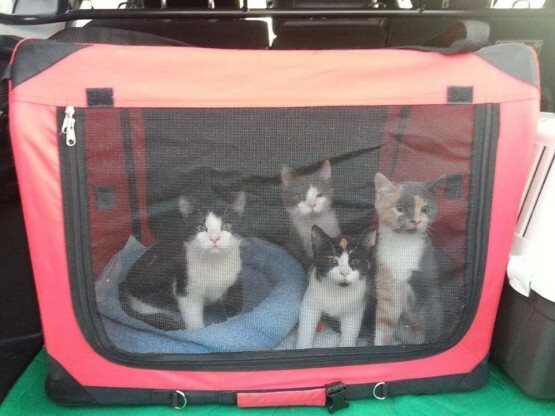 The kittens had to be fed every three hours so Natalia went and bought a cat carrier to take them to the bear sanctuary with her, Jack and Penny. Unfortunately, one of the kittens died due to the fact that he lost his reflex to swallow the food. Soon, their little personalities started to show which made the need to find a home even stronger. “Black-and-white Phoebo was the alfa male from the start. Tri-colour Pickles was always catching him up. Grey-and-white Patrick was a charmer from a very early age. Tiny Peppa made up for her size by a vocal display that earned her the nick-name of Suk (I think) from Penny.” Soon, the volunteer’s time in Romania was nearly up. Starting to fret, they were desperately clutching at every straw available electronically, trying to find a person who could foster the kittens until they were old enough to travel. If such a person could not be found, kitten’s fight to survive would have been futile. “This is when Anne, of Oyster Worldwide, found Darclee Bottez, a passionate animal lover who was due to participate in one of Oyster’s programmes in South Africa and who lived in Bucharest. Miraculously, Darclee agreed to help us! No one can imagine what a relief that was, a true miracle! 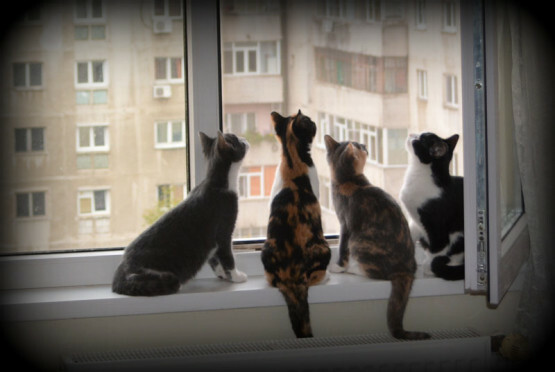 With the kittens’ future was secured, we could actually enjoy rearing them.” When the time came for Natalia, Penny and Jack to go home again, they travelled down to Bucharest to be handed over to Darclee and her husband, who both did a great job raising them, and finding out about passports for animals. The next hurdle was bringing them over and finding owners for them. It took several months to find people to adopt the cats. Suddenly Sarah had a break through as she had a friend called Martin who was interested in the final kitten to be rehomed. So this meant, I had Pheobo and Pickles, Sarah had Peppa and Martin and his girlfriend Emma got Patrick. Finally, we could bring them to England! Darclee and her husband wanted to bring the cats over personally and drop each one off to their new homes. Unfortunately, this was not to be the case, just as we thought our bad luck had run out, they broke down in the Germany!! This meant we had to hurry and find someone to being the kittens over. Luckily, Natalia knew someone who was bringing over some Romanian dogs and after a few emails to and fro with the company, we found out that the driver was on his way through Germany and would be stopping off a couple of hours away from where Darclee and her husband were staying. Eventually, Darclee had to face the hard task of handing over the kittens to Jason (the driver) and watch them set off for their new lives. It was soon arranged that Jason would meet Sarah and Natalia at Dover and I would go down to Sarah’s to pick up my two cats. Again, this was not to run as smoothly as we had hoped. We soon found out that the ratio of people to animals in the van of Romanian dogs and cats was below the legal requirements to bring them into the country. Poor Sarah and Natalia volunteered to get up at 3 o clock in the morning and travel all the way to Calais and meet Jason. They arrived and got the cats over without a hitch. Sarah says “everyone was commenting on how lovely the kittens were”. So that day, I travelled down to Sarah’s house in Aldershot from York to pick up the cats as planned and Sarah and Natalia got through Calais and Dover back to their own homes. Sarah’s mum let me into Sarah’s house as I had arrived before her which felt strange (as it always does when you’re in someone’s house without the owner). When Sarah came through her door I was so excited to see her and the cats again. She had brought all the cats back to hers and then Martin and Emma would come and pick up Patrick later on. We let them out and let them roam around for a while so that they could stretch their legs and use the litter tray. We felt horrible separating them but I had to be getting back with it being such a long drive home. All the cats have settled in to their new homes and are extremely happy and bouncy. Perfect ending to a turbulent start in life, let’s hope the rest of their lives will stress free.